Corsair is one of the major PC hardware companies. 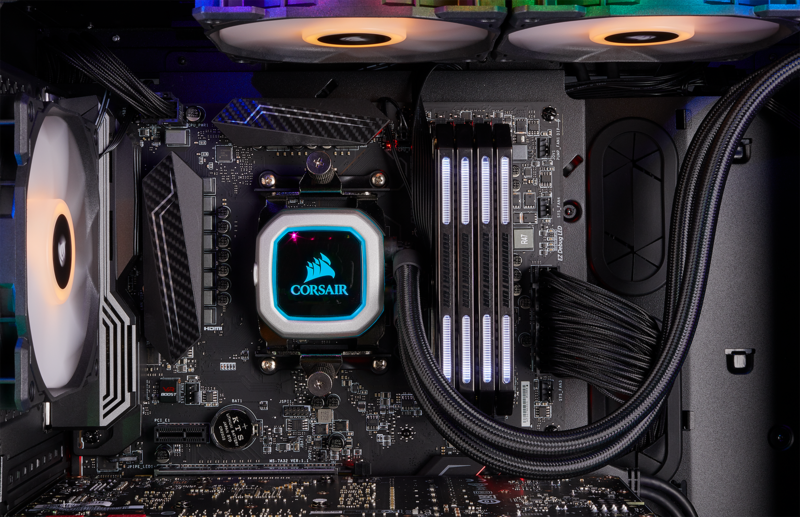 It is now ready to launch Corsair H100i Pro, one of its most well-known and acclaimed liquid cooling CPU. This brilliant piece of CPU cooling hardware will feature an integrated fan controller. This controller will be inside the pump block. Just like other GPUs, the controller will shut down the fans when the liquid is below a marked temperature. Nvidia introduced the feature with its GTX 900 series. AMD adopted it later with the RX 400 series. Corsair is claiming to have helped users with one of the biggest downsides of high-end hardware. The Zero RPM Fan Mode will help with the noise reduction and get the consumers to get Corsair H100i Pro. Of course, with a setup like this, a software is a must thing to include. For this purpose, Corsair iCue software will play its part in controlling the fans RPM. The software also controls the RGB LEDs, that light up the pump box. The package does not contain any RGB fans though, instead, ML 120 fans are inside the cooler box. The fans generate up to 400 to 2400 RPM. The fans can push 75 CFM of air and produce a noise of about 37 dBA. The RGB pump and its block looks almost the same as the recently released H100i. The assembly has same octagon shape and silver finishing. The cooler is able to support almost every modern socket type. This will include LGA 1150, LGA 1151, LGA 1155, LGA 1156 LGA 2011 and LGA 2066 from Intel. While from AMD it will support AM4. The price of Corsair H100i Pro has not announced yet. But for now, we can only estimate it to be between $120 and $150. Although it will come as a great surprise if its ever under $110. Like the price, the launch date has also not revealed. But user may get some news about it soon.